Batman and Superman are not my favorite DC Comics characters. Green Lantern holds that coveted spot. Sadly, the Green Lantern movie was not good and I must content myself with these two for my big screen DC fare. Going in, I had low expectations because I am not invested in these characters. I was not impressed with Man of Steel which further moved the bar lower for my expectations for this movie. After sitting through the end of the credits and having nothing to wait for, I have to say that I am mostly whelmed with Batman v Superman. Not overwhelmed nor underwhelmed…just whelmed. This movie picks up sometime after the end of Man of Steel. Metropolis is recovering from the aftermath of dealing with the Kryptonians, congress is trying to deal with the threat that Superman represents, and the world as a whole is undecided as to how view Superman. the audience is treated to watching as Lois Lane places herself in harms way for an interview in the middle east. The interview goes south quickly and she is taken captive. This brings Superman to her rescue which causes an international uproar. The audience is also treated to an abbreviated origin story for Batman. We get to see through flashbacks and dreams Batman’s inciting incident as well as the cause for his current hatred of Superman. We get to watch as he speeds through Metropolis to get to his building in the hopes of helping his employees evacuate. He is not in time. He is only able to help rescue one man whom is trapped under a fallen I beam. The despair, anguish, and anger are plain upon his face as this scene comes to a close. The audience is also introduced to the villain of the piece, Lex Luthor. He is a young entrepreneur who is at the top of his game. He has his own corporation that rivals Bruce Wayne’s. He is able to meet with Clark Kent and quip about whether he owns the daily planet or not. On top of this, despite having no powers, he manipulate the system to pit the two titular heroes against one another while putting a fail safe plan in motion as well. all this while appearing quite insane. I walked out of the movie, not disappointed per se, but that there was so much that was left on the table. 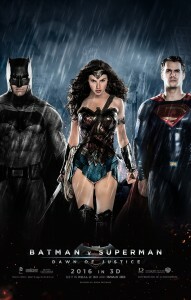 This movie presents to the world what is, in the DC Universe, the trinity. The three most powerful and iconic heroes of DC Comics. After some thought I’ve decided that this is what frustrates me about this movie. It presents not one trinity, but two. The first trinity is Batman, Superman, and Lex Luthor. They are the heavy handed characters of the film. Every move they make is filmed with a loving lens that lingers longingly. There is a scene where Superman has flown Doomsday into the upper atmosphere and is hit by a nuclear weapon. Doomsday plummets to the earth while Superman drifts in space seemingly dead. The audience gets to watch as the sun lovingly caresses his form and returns him to life. This is repeated for both Batman and Lex Luthor throughout the movie. It takes what are important plot points and extends them into the grating range. I understand most are needed to set up the next movies but a little bit of restraint would have been appreciated. It feels like Snyder has went to great lengths to have each one of these characters represent the White Man’s fears. Start with Batman. He is the ultimate rich white guy with everything he wants and is the Batman on top pf all that. Superman comes along and demonstrates that for all intents and purposes that there are always things beyond a person’s control. What is Batman’s response? That which takes control away from me should be destroyed. Superman on the other hand does have the ultimate power. Whatever he wants is not out of reach. He just has to reach out and take it. This power leads him to be seemingly paralyzed at points about what to do. His every action analyzed for the possible unforeseen consequences. The only time this is not a problem is when the one he loves is put in danger and then all thought of consequences are dropped and action is swift and final. Lex appears to represent grasping avarice. He sees things that he believes others have missed and decides to take action unilaterally without even consulting those that he purports to be saving. He knows better than anyone else what is best and the consequences of his actions be damned. This is in stark contrast to the other trinity you can find in the movie. This one being Lois Lane, Martha Kent, and Wonder Woman. Each of these women goes about their lives with a quiet strength. Martha Kent is now a widow that works as a waitress while keeping up the farm. She does all this and has time to be there for Kal El and dispense motherly wisdom to help free himself from his analysis paralysis. she stays strong even in the face of death as she knows that her son has to save the world and that he has to make the right choice. Lois presents this same strength from the very beginning. She goes into the heart of danger to follow a story. She does this knowing that even though she is beloved at Superman, there are situations that even he can not save her. She does not avoid these situations but continues to do her job despite this knowledge. Wonder Woman, though in the movie briefly, epitomizes the hero. She dances lithely through the story when she appears, doing what she has came to do and moving on. When the circumstances get dire, she gets off the plane, puts on her bracers and tiara, goes to work. She shows no hesitation in facing the monster. On the contrary, she revels in her role as hero that fights the monster. She knows who she is an why she does and holds nothing in reserve. She provides a role model for the other two heroes to live up too. I loved the story that you see playing out with the three women in the movie. It is subtle and overshadowed by the melodrama that is the tow heroes and the villain. It took a bit to realize that this is what bugs me. Snyder has both of these stories going on but leans so heavily on Batman and Superman that you wonder why he bothered to have the other story present. I wanted to see more of Wonder Woman, Lois, and Ma Kent. Hell, Alfred was a solid character that provided grounding for Bruce Wayne and was underutilized in this movie. Despite all of my complaints, it is a solid movie. The acting is good. The effects are well done. The technical aspects of the movie are handle with Aplomb. It just could have done with a little more discipline in the editing and cinematography. Cut some of the time dedicated to the angst driven heroes and show us more of those that support them. I give Batman v Superman two bear paws out of four. It was an okay movie that just felt meh. More time spent with Wonder Woman, Lois, and Ma Kent would have made the movie live up to the hype that had preceded it. Hercules is another book that fits well into the magical theme that I have been following recently. 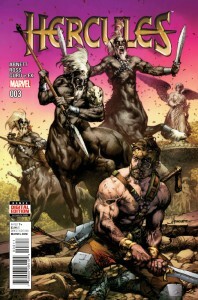 This new addition to the Hercules mythos is being written by Dan Abnett with art work by Luke Ross. Hercules has a storied past in the Marvel Universe with a reputation for being a drunken womanizer that causes more damage than the help that he purports to offer. Abnett capitalizes on this past and spins a classic story of redemption mixed with the modern idea of re-branding. This current story arc opens with Hercules having set himself up in a regular apartment in New York City. He has a land lady that is gives him life advice about being among the regular people. He also has a roommate, the immortal Gilgamesh, that has fallen on hard times and is in need of a role model in this modern age. Hercules is working hard to be a better hero. He is adapting to modern times and using modern tactics and weaponry. He has done this both to better understand the time he lives in as well as cut down on the wanton destruction that has continually followed in his wake. As the story unfolds over these first few issues, we learn that creatures from various myths and legends are fleeing their old haunts and looking for sanctuary wherever it may be found. This has led to the many encounter that Hercules has had to deal with recently. Each one speaks of a coming”Storm” that is driving out the old. These pronouncements are much like any prophecy or clue, duly enigmatic to fit in with the mythological aspect of Hercules. It requires consultation with blind Tiresias for Hercules to learn that the coming storm is referring to a modern pantheon that is arising and seeking to supplant the old. I love what Abnett is doing with Hercules. It taps into the style of stories that were told around the Greek Myths. Everyone knew the stories, to make them interesting and memorable the tales were altered in the telling. This allowed the core of the characters to remain while the stories themselves adapted to the time and place of the telling. I love the idea of a demigod striving to change the image that he has created with the idea that his legacy can be eternal and that he cares what that legacy can be. It takes a Greek hero that was not very heroic in the myths and wasn’t all that great of person in the recent past and puts him on a quest. It hits the classic beats of the heroes journey but does it in a modern fashion which is refreshing. Abnett is also creating a supporting cast for Hercules that is interesting and solid as well. In particular, I like Sophia and Gilgamesh. Gilgamesh is the friend that holds up the mirror to Hercules. Gilgamesh shows what Hercules was and what he could be again if he gives up on this new path. Instead of being a flat caricature of Hercules, he has his own goals and motivations that are spooling out in an intriguing fashion which makes me want to know more. Sophia is the strong land lady that provides a tether to mortality for Hercules. She helps him wander through the process of changing his reputation with the world as well as how to be a better person all around. She does this while still having faults and foibles like the rest of us. Luke Ross does an excellent job on Art. His style has a rougher edge that goes a long way to making Hercules accessible. It takes the mythic themes and makes them feel more grounded. The action sequences are crisp and clean making the fights sequences easy to follow. He takes the story that Abnett is creating and brings it to life with ease. I am enjoying Hercules very much. The books provides a new twist on an old favorite character. The story is well done and I appreciate that it is following in a similar narrative vein as Doctor Strange and Scarlet Witch. This book is an excellent addition to your pull list. I give it three bear paws out of four and am looking forward to the next issue. I’ve decided to try and maintain the magical theme for a bit when it comes to comics. This week I am jumping aisles and talking about a book of the magical persuasion from DC Comics. In the DC continuity, there are many minor characters that are touched by magic. The new 52 had a cadre of mystical characters that comprised Justice League Dark but the title has went the way of the dinosaur. Also, none of the characters that graced the team were ever on my favorite list outside of John Constantine. For DC Comics, my favorite mystical hero was by far Doctor Fate. The shiny helmet, the sleek costume, the Egyptian mythology blended with lords of order and chaos was a heady mix. There were multiple incarnations of Doctor Fate, a married couple, a prisoner in the helmet, and even a knife fighter with mystic bandages. I enjoyed them all. When I saw a preview for the new Doctor Fate, I knew that this would be a title that I would pickup because that is how I roll. The creative team behind the new book is Paul Levitz and Sonny Liew with occasional guest artists. Paul Levitz has worked in the comic industry and has worked on one of my other favorite titles from DC, The Legion of Superheroes. 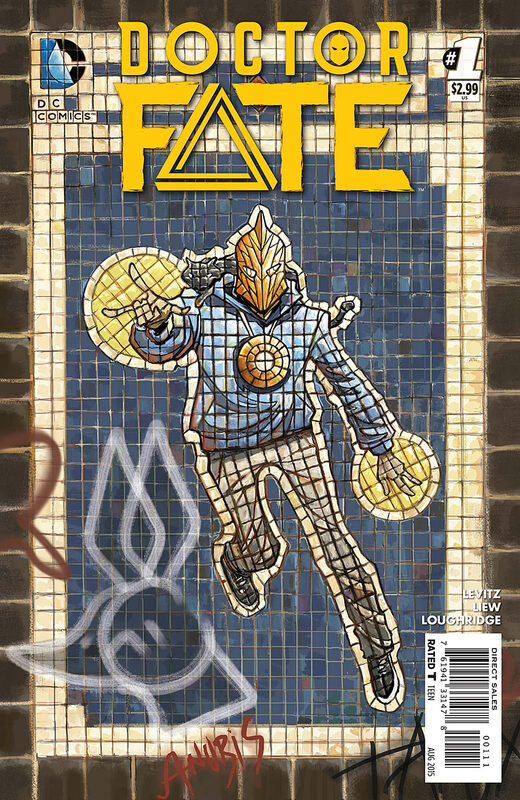 In this new iteration of Doctor Fate, Levitz has taken the time embrace the Egyptian heritage that has been a part of Doctor Fate and placed it front and center. Anubis has decided that the world must be punished and has set about to destroy it with a flood of epic proportions. To save the mortals, Bast intervenes and leads someone with the blood of pharaohs to take up the helm of Thoth. Khalid is destined to take up the mantle of Doctor Fate. He is a child of two worlds. His mother is American and his father is Egyptian. He is new med student who is trying to decide between the woman who is attending med school with him and the one whom protests the treatment of Egyptian and others of middle east descent in America. He is a man of science that is faced with the unbelievable and granted the ability to see behind the curtain of reality and given the chance to make a difference. His world is turned upside down by the new power and his adviser, Nabu, isn’t the most helpful spirit. 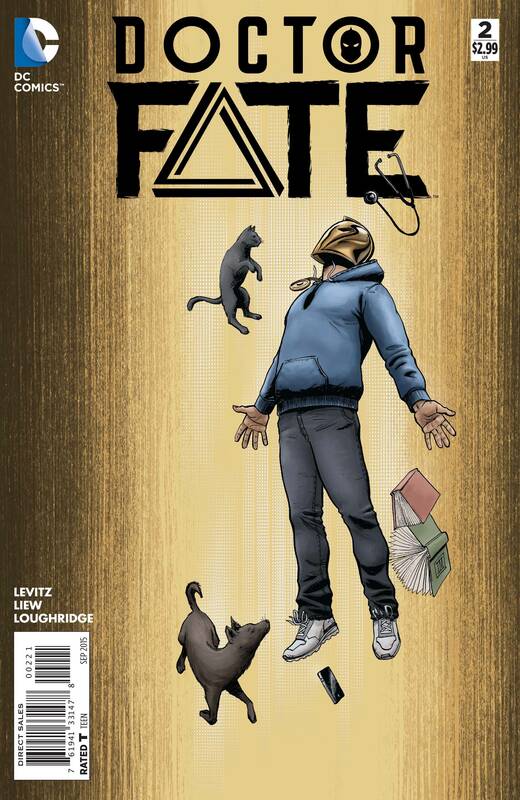 I love the new direction that Levitz has taken with Doctor Fate. Khalid is a character that straddles many worlds which is a trope that sits well with any practitioner of magic. The world of his mother and father are very different places. Both care for him deeply and give him the love and support that he needs, but each world has it’s own rules and requirements that place conflicting constraints upon him. These same ties can be seen in his struggle to come to grips with the gods of Egypt visiting a plague upon the earth as well as trying to stop it. DC Comics is known for making horrible mistakes when it comes to diversity in it’s titles but Doctor Fate is showcasing that they can get it right if they stop trying so damn hard. Sonny Liews art work provides wonderful support for the the story that Levitz is crafting. Khalid is charged with healing the world. His first task is to pull the world back together that Anubis is unraveling at the edges. Liew’s art has that rough around the edges look that lifts up this idea that the world is struggling and in pain. The dark hues that haunt the storm that is descending upon the earth throughout the story is both brooding and anxiety-inducing. It gives the feeling of an electricity that is running under the surface to reflect the conflict that is building in this first story arc. Doctor Fate is currently at issue number nine and I am enjoying each issue. I am keeping my fingers crossed that DC doesn’t cancel this title as they are doing something good here that I would like to see more of in the DC Universe. 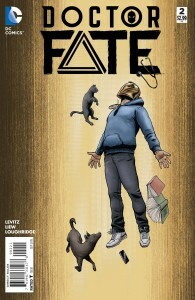 If you aren’t reading Doctor Fate, I recommend giving it a read. I certainly give it four bear paws out of four! It should be apparent by now that I am a fan of the fantasy genre. Magic and things occult are ideas that will always garner my attention. In the past, I would read any of the mystic heroes from Marvel or DC. The sad part was that these books rarely lasted long. 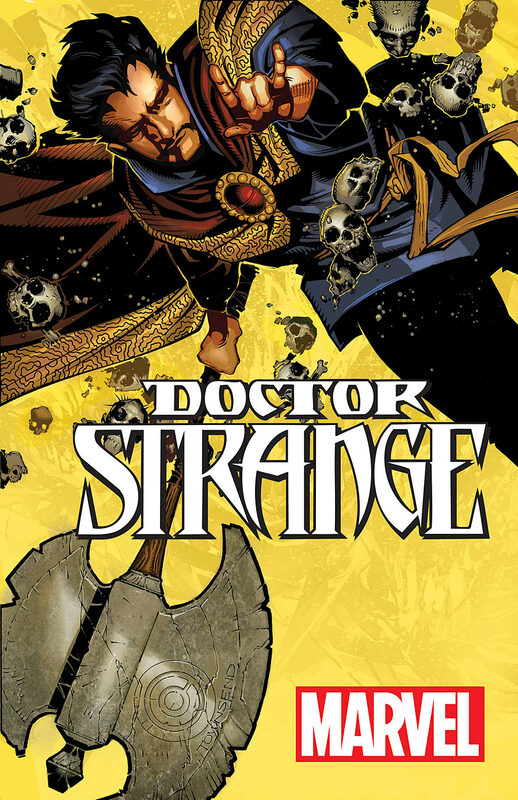 The long famine of these types of heroes and stories has ended and one of my favorite characters has their own book again, Doctor Strange. I will admit that I am unfamiliar with some of the backstory that has built up behind my beloved hero. I have not read much of the books that he has appeared in prior to getting his own book. 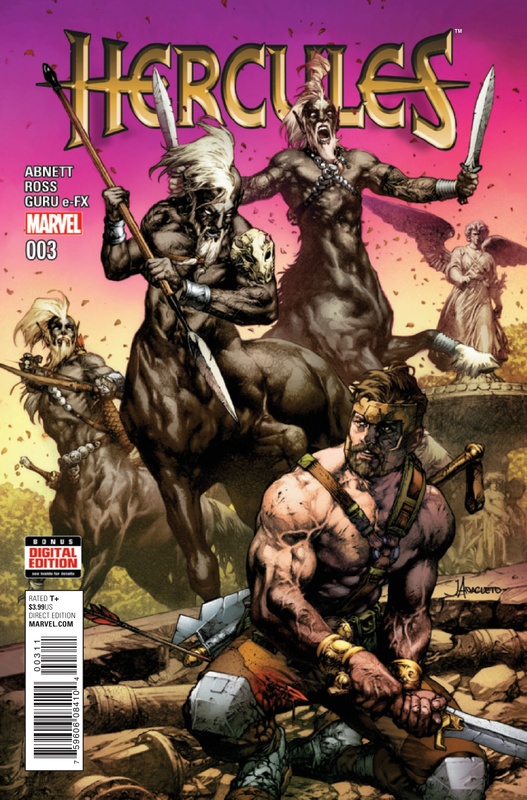 I knew that the write Jason Aaron had done an excellent job with Thor in his recently and trusted that his writing would allow me easy access to this story. I was not incorrect in this assumption. Aaron gives a wonderful explanation of magic in the Marvel universe in this book. He explains it as more of a piece of reality that not everyone can see or experience. There are things that dwell in and around us that are just as natural as the bacteria in our stomachs and just as useful. There are also things that are not so beneficent and plain just don’t belong here. The story that Aaron weaves in these first few issues explore facets of the character that I have wondered about before. He not only allows us a peek inside the mystical community of the current Marvel universe but he takes us inside the Sanctum Sanctorum. These early issues show the audience more of the workings that keep the sorcerer supreme running than I was previously aware of…and it’s awesome! Layered on top of this Better Homes and Gardens view of Doctor Strange, is the more important story. This is the assault on magic which also ties in well with theme that appears within the pages of Scarlet Witch. The Sorcerer Supreme’s of other dimensions are all being murdered and their realms stripped of all magic. Stephen must marshal his will and keep this fate from occurring in this dimension. This excellent writing is supported by the strong work of Chris Bachalo. his art blends the style of four color super heroes with the outlandish weirdness of the arcane with ease. There are pages where he mixes colors with with whites to give that feeling of two separate but interconnected dimensions well. Unlike the art in Scarlet Witch, Bachalo’s shuns the ethereal feel and goes for a more visceral take that embraces the weird that is inherent in this world. 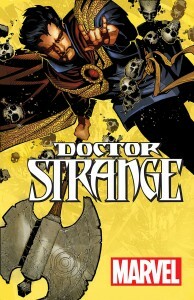 Doctor Strange is one of my favorite comics being release currently. I would give it three bear paws out of four. It is definitely worth adding to your pull list and reading it from issue one. I look forward to each month’s new issue.